Be grateful you live in an era of modern medicine. Indeed, be grateful your ancestors survived their era at least long enough to create the next generation. 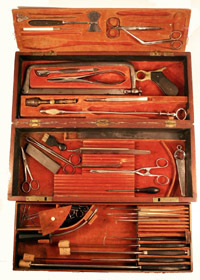 The implements in this elegantly boxed general surgery kit glint and hint of an era when medical treatment was often a ruthlessly direct process, a sharp-edged probing, cutting, and suturing. Perhaps a pat on the back for post-operative follow-up. Like many museum artifacts, this kit has come down to us reflecting the batterings and winnowings of time, with many original instruments now missing, and the inclusion of additional items. Which likely indicates that the case was in use rather than sitting remaindered in a medical purveyor's warehouse. 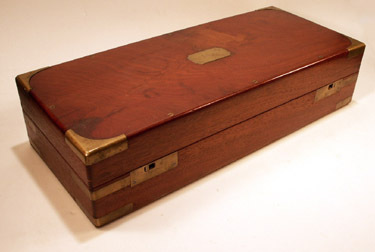 Although an instrument case of this quality and capacity was usually acquired by a trained medical practitioner, it is quite possible that it could have been brought along by the resourceful master of a vessel in the not unlikely event that a crushed finger or limb had to be amputated. From the encyclopedic (Cataplasm to Yaws) New England Popular Medicine, 1848, carried aboard the Bath ship TEMPEST: "It is not always easy to decide upon the necessity and propriety of this operation; but the operation itself, when determined upon, is one of the simplest and least dangerous." While this may seem to us a drastic measure, in a time before antibiotics and any true understanding of infections, removal of severely damaged tissue and bone was critical if "mortification" -- gangrene poisoning -- was to be forestalled. This was the accepted way of the world, whether on the farm, the battlefield or the slippery decks of a ship. "It is not uncommon for people to put themselves to much trouble and unnecessary expense, in sending a great distance for a surgeon to amputate a limb,when, perhaps, the nearest physician at hand might do it equally as well with a great saving of time, and prevent the danger sometimes attendant upon delay." -- New England Popular Medicine. Let us note the word, "perhaps..." in that last sentence. Like many hand tools of the 19th century, the standard of manufacture is of the highest; the bone and rosewood handles and mirror finish of the blades radiate an aura appropriate to their dignified, if somber, calling. Needless to say, the edges are still lethally sharp. By 1890, wooden handles had been replaced by all-metal versions as awareness of sterilization techniques grew. 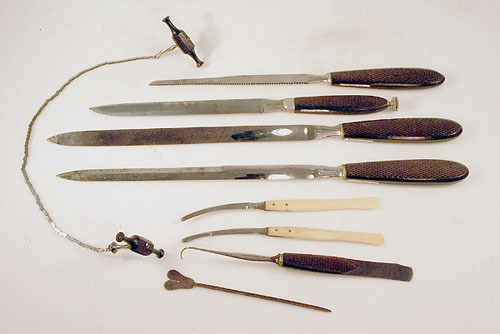 Several other tools can be seen here, their use and terminology barely beyond the medieval: a trocarfor bladder puncture or drainage of a body cavity; a tenaculum for hooking arteries to pull them out enough to tie them off; a catlin, or double sided amputation knife for cutting in both directions; a metacarpal saw to separate small bones of hand or foot; the capital saw, so-called due to the fact that a person's life was at stake when it was in use. Trephining (or trepanning) instruments are also in our kit, used for removing pieces of the skull in order to relieve pressure on the brain tissue, lift a compression fracture of the skull, or remove a blood clot on the brain: the Hey saw, and a trephine with Galt style cutter. The turning handle for this is missing, but the tool (or is it an instrument?) was deftly twisted into the skull like a corkscrew. Bone dust, with its finely-particled density, tended to clog saw teeth more readily than wood. A bone dust brush is included in any complete trephining kit. Noticeably absent in this collection is a tourniquet, consisting of a woven strap and tightening clamp, which would have been folded into the triangular compartment, still with its lid. An undoubtedly later addition is the promotional magnifying glass , which seems out of character, indeed a bit frivolous, next to the solemnity of the edge tools. In conclusion, just in case you were wondering: "The pain of the operation [amputation] is undoubtedly great, but not insupportable. The common opinion that sawing the bone is very painful is erroneous, as the bones in a healthy state are insensible; and except the saw heat, the only sensation is a disagreeable jarring," -- New England Popular Medicine. Perhaps these words re-assured Capt. E. P. Stinson of the TEMPEST as he bent, saw in hand, over the mangled foot of one of his crew.